North Hollywood, California, December 2004 - Lisa Marks, of Creating Marks - Website Design, adopted a pet bunny in August 2004. 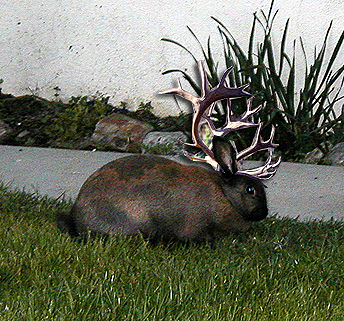 Just recently, the now rabbit, started sprouting antlers. 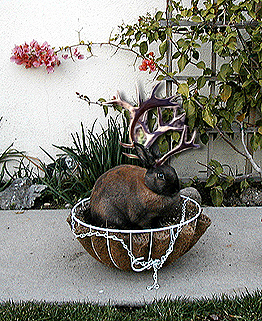 Ms. Marks researched this anomaly and discovered that she did not have a rabbit, but instead, a rare Jackalope. 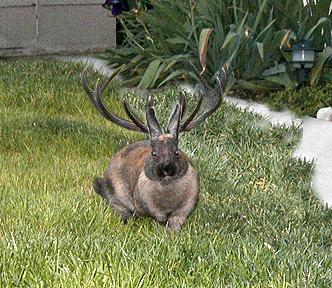 The Jackalope (Lepus-temperamentalus) is an antlered species of rabbit, and is one of the rarest animals in the world. Unfortunately rumored to be extinct, though occasional sightings of this rare creature continue to occur, suggesting that pockets of jackalope populations continue to persist in its native home, the American West. A cross between a now extinct pygmy-deer and a species of killer-rabbit, they are extremely shy unless approached. As an aggressive species, it uses its antlers to fight. Thus, it is also sometimes called the "warrior rabbit." Known by the ancients as "deerbunnies", it wasn't until the early 1960's that the modern more fearsome name of "Jackalope" was adopted because it looked like a jack rabbit and an antelope. Jackalopes possess an uncanny ability to mimic human sounds (as well a pig's grunt and cat's purr). In the old West, when cowboys would gather by their campfires to sing at night, jackalopes would frequently be heard singing back, mimicking the voices of the cowboys. Jackalopes become especially vocal before thunderstorms, perhaps because they mate only when lightning flashes (or so it is theorized). When chased, the jackalope will use its vocal abilities to elude capture. For instance, when chased by people it will call out phrases such as, "There he goes, over there," in order to throw pursuers off its track. The best way to catch a jackalope is to lure it with a whiskey (or an vodka or Gin martini with olives), as they have a particular fondness for this drink. Once intoxicated, the animal becomes slower, more laid back, and easier to hunt. Douglas Herrick, a long-time resident of Douglas, Wyoming, is often credited with popularizing knowledge of the Jackalope. In the 1930s Douglas and his brother Ralph began selling mounted Jackalope heads to the public, and these became wildly popular. Examples of their work can be found in many bars and homes throughout the United States. Jackalope postcards also became a popular Western souvenir. Douglas Herrick died on January 6, 2003 at the age of 82. One can see photographs or purchase these mounted (taxidermy) jackalope heads by typing in "Jackalope" in an eBay.com search. Creating Marks is located in North Hollywood, California and was founded in 2001. The one one woman creative company designs, builds and updates websites and web advertisements, as well as consults on marketing and driving traffic to the sites. To learn more call 818.759.0402 or visit www.creatingmarks.com. * Roger L. Welsch. Tall-Tale Postcards: A Pictorial History. A.S. Barnes and Company. 1976. Pg. 78-79. • Dance, Peter. Animal Fakes & Frauds. Sampson Low. Berkshire. 1976. Pg. 114-115.